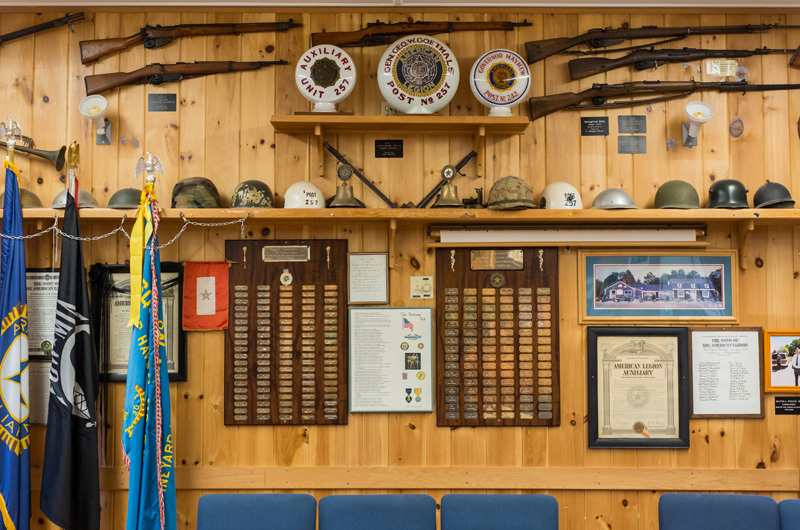 American Legion wants to protect and catalogue its collection of artifacts. Sewer expansions to protect sensitive ponds and watersheds and big-ticket spending to bury utility lines on Beach Road will top the agenda when Tisbury voters convene for annual and special town meetings next week. A special town meeting begins at 7 p.m. Tuesday in the Tisbury School gymnasium, immediately followed by the annual town meeting. Moderator Deborah Medders will preside. There are 15 articles on the special warrant and 36 on the annual warrant. Voters will be asked to approve a town budget of $27.1 million a 6.3 per cent increase over last year. Finance director Jonathan Snyder said the biggest drivers in the budget are an increased assessment for students at the regional high school, and increases in health insurance. Tisbury’s high school assessment went up about 20 per cent this year — a $741,000 increase — due to higher enrollment from students in town. “In a budget of 27.1 million, that is a significant increase,” said Mr. Snyder. Still, he noted there will be no need for a general override to Proposition 2 1/2, the state-mandated tax cap, this year. Selectman and board chairman Melinda Loberg said all town department heads were asked to keep spending to a minimum this year as a new school building project lies ahead. With funding from the Massachusetts’s School Building Authority, the town is designing a new elementary school. It has not been decided yet whether the school will be rebuilt on site or in a new location. If the school moves, the town would have the current school building at its disposal. “We’re trying to do all this in context of where the school’s going to be,” Mrs. Loberg told the Gazette, speaking of spending needs. Meanwhile, the town continues to confront concerns about excess nitrogen in its saltwater ponds and watersheds. Extending sewer lines to the State Road business corridor has been on the drawing board for a couple of years, and next week voters will be asked to spend $50,000 for planning and engineering for the project. In its first phase, the town wastewater plant was designed to protect the harbor from pollution by connecting downtown businesses on Main and Water streets to sewers. “Now the emphasis is to look at areas that are primarily feeding into Lagoon and Tashmoo so we can start chipping away on the nitrogen there,” Mrs. Loberg said. Voters will also be asked to spend $60,000 for engineering to bring online the so-called wicks — a vertical leaching field for the wastewater treatment facility that aims to save space and nearly double the capacity of the plant. “The first step is to do the engineering for the pipe to the leach field to the wicks,” Mrs. Loberg explained. In separate articles, voters also will decide whether to extend a sewer line to the old marine hospital, the new site of the Martha’s Vineyard Museum, and to three lots on High Point Lane. Neither article has money attached. The sewer connection for the High Point Lane lots was required by the Martha’s Vineyard Commission during a recent review. Mrs. Loberg said the museum plans to pay for its sewer connection and could extend an option for Skiff avenue residents to tie in. “That guarantees they don’t contribute nitrogen to the watershed,” she said, noting however that other neighbor concerns about the museum’s building plans could surface at the meeting. In one of the biggest spending items this year, voters will be asked to allow the town to borrow $1.8 million to bury power and utility lines along Beach Road. Last year a request for $300,000 for design and engineering for the same project failed. Mr. Snyder said the change this year involves financing — the town now hopes to pay for the project through a bond. The project is part of a larger and long-debated state public works initiative to redesign and reengineer the stretch of Beach Road that runs roughly from Five Corners to Wind’s Up. In order to pass, the $1.8 million article also needs approval in the ballot box at the annual town election in two weeks. Mrs. Loberg said MassDOT is at the 75 per cent design stage on the Beach Road project, so when it comes to putting utilities underground, it could be now or never. “We thought here’s one last opportunity, we have a better idea of the price, it’s a time when if the town approves it we can have the work done simultaneously with the construction of the road,” she said. Voters will be asked to spend $60,000 to design an expansion to the town library, a project that does not have the support of the selectmen or the finance committee. A request for $750,000 to build a new waterworks garage does have the support of the selectmen and finance committee. The plan to build a prefabricated garage and office building up the hill from the current location on Spring Street was put on hold last year when the Tisbury school building committee thought it might consider the site as a possible location for a new elementary school. The site has since been ruled out, putting the waterworks project back on track, Mrs. Loberg said, noting that the price has already gone up. Capital improvement projects include $30,000 for roof repairs at the town hall, $20,000 for police department repairs, $36,000 for new snow plows and $65,000 for 20 new transient moorings. More than $1.3 million in Community Preservation Act funding requests will come before voters. They include Tisbury’s share of funding to replace the roof at the old marine hospital, and another $50,000 to repair the porches on the building. Three CPA funding requests would go toward restoration and historic preservation at the American Legion Post 257. In addition to $70,000 for general building repairs, $10,000 is needed to restore the flagpole and $30,000 to catalogue and preserve an array of artifacts. Jeff Kristal, a member of the American Legion building committee, said this week that the archives of historically significant war items include a civil war rifle and posters from both World Wars. Other CPA funds would go toward lighting and sound repairs at the Katharine Cornell Theatre ($30,000), Owen Park improvements ($80,500) and affordable housing requests ($469,650 for the Kuehn’s Way project, $120,000 for rental assistance and $50,000 for the town affordable housing trust fund). Voters will be asked to allocate $278,500 in ferry embarkation fees for a variety of projects, mostly focusing on public safety. Wages for summer police officers, training and equipping the Islandwide tactical response team and EMS equipment are all on the list along with repairs to the Owen Park dock, downtown beautification and sidewalk replacement. Embarkation fees come from passenger ticket sales by the Steamship Authority and go to all the port towns. As the main year-round Island port,Vineyard Haven receives a large share of the funds. A bylaw to regulate rental housing appears on the special town meeting warrant but will be withdrawn by the selectmen, who voted this week to hold more public meetings before bringing it to voters. “Because we hadn’t had public hearings, there would have been a lot of discussion and questions that would have been more appropriate at a public meeting,” Mrs. Loberg said. The annual town election is May 9. The ballot includes a question to allow the sale of hard liquor in restaurants, in addition to beer and wine. Mrs. Loberg is up for reelection as selectman and will be challenged by James Rogers. Joseph McCarthy is running against incumbent Hillary Conklin for town clerk. It is hard to understand how this (Shared Use Path on Beach Road) project has gotten this far without ever having had a study done to evaluate how it would work. I have been involved in this project for years and marvel at how people in Tisbury have been manipulated by the Commission including our selectmen and planning board. There was one pre-feasibility study done in 2008 on which all of this planning has relied. In this pre-study, to make long story short, there were some important facts which have been ignored. One of them is that a termination which would cause an intersection was to be avoided. This is what the result of the planning produced. Another was a recommendation that a study be completed - but no one wanted to spend the money for it. Another part of the pre-feaisibility study was a lengthy list of approx. 23 alternative routes to follow that would continue the Shared Use Path - however - the topography and other hindrances simply made this impossible. Another fact that voters should know is that the project has mushroomed since its conception. Initially the cost was projected at $2.1 million dollars. It then went to $3.2 million and disturbingly and without any explanation the most recent email I received from the Commission which includes a PDF file lists the new estimate at $4.6 million dollars. This is insane. The entire project is one giant mistake and I urge Tisbury voters to vote no on any funds for this project and allow it to expire so that it can be re-evaluated. Putting the utilities underground is and essential goal but the town has completely not done its homework on the financial end of this nor on the coordination of the various utilities necessary for this to happen nor on the details of the project. This should have happened long ago but never did. This entire project on Beach Road should be halted. It is truly sad how little understanding and care has been taken by our elected officials with respect to this entire project. How about a full plan for Beach Road and the Harbor? There needs to be a broader beautification effort for that whole area. Reluctancy to make any changes from those insisting on Vineyard Haven maintaining its "working harbor" are missing the boat. Vineyard Haven Harbor and Beach Road should, and could be the crown jewel of the Vineyard, bringing much needed business revenue from tourists visiting new waterfront restaurants & shops. We need to ease the tax burden on the residents of the town, and this area should be maximized for a greater purpose. With a little foresight both a working Harbor and a destination for those visiting the Island could be achieved. Vote no Tisbury voters, and insist that elected officials think bigger about the area then burying utilities poles. Well said comments; agree that the project needs more thought and financial planning. The entire area, harbor, beach road etc... needs attention and has been sorely neglected. Bravo. Well written and well thought out. My turn and I'll be brief. Two items need to be dealt with: traffic and parking.